Aéropostale: Exclusive Black Friday Sale 50-70% off. Alternative Apparel: Up to 75% Off Final Sale. Ann Taylor: Extra 40% Off All Sale Styles. Discount applied at checkout. Ann Taylor Loft: 40% Off of EVERYTHING. Use Code: GIFTITUP. ASOS: Up to 60% Off Shoes and Accessories. Banana Republic: Beat the Holiday Rush 40% off your purchase. Bandier: Up to 70% of on ALL SALE STYLES! Extra 20% Off All Sale Styles Use Code: EXTRA20 (Ends 11/22). Barneys Warehouse: Black Friday Sale Up to 75% Off. Beautyhabit: Free Shipping on ANY Order Use Code: THANKFUL (Ends 11/26). Natural Beauty Favorites: Spend $150+ Purchase Receive the ultimate 20 piece goodie bag, or Spend $250+ and receive the goodie bag PLUS a $50.00 E-Gift Card Use Code: NATURAL. Spend $150+ on Cult Favorites and receive the ultimate 20 piece goodie bag of the most eclectic, coveted and classic brands, or Spend $250.+ and receive the goodie bag PLUS a $50 E-Gift Card Use Code: CULT. Spend $100+, receive the ultimate 9 piece goodie bag for Men's Favorites, or spend $250+ and receive the goodie bag PLUS a $50 E-Gift Card. Use Code: MEN. ALSO Huge Selection of Special Offers and Free Gifts. b-glowing: Huge Selection of Special Offers. There are some amazing finds, too! Get the Limited Edition Erno Laszlo Hydra Therapy Skin Vitality Treatment - 28 pack for $400 (Valued at $560.00). 20% Off orders of $50.00+ Use Code: DREAMDEALS (Ends 11/28 11:59pm PST). Bloomingdale's: Thanksgiving Sale Part I: Big Brown Bag Sale Big Brown Bag Sale! Take $25 off every $200 you spend on a large selection of items (Ends 11/22). Buy More, Save More! Take 15% off when you spend $100-$199.99 or 20% off $200+ on a large selection of items (Ends 11/25). Cyber Sunday! Take 25% off a large selection of items (11/26 Only). Cyber Monday! Take 25% off a large selection of items (11/27 Only). 10% Off Beauty Cyber Offer Online Only Beauty Offer! Take 10% off almost all beauty purchases (Valid 11/26-11/27). Boden: 30% Off Sale. Plus Free Shipping and Returns on Orders of $49.00+ Use Code: CY8H. Chico's: 40% OFF YOUR ENTIRE PURCHASE Passport members take an extra 5% off. Use Code: 29037. Clarins: Thanksgiving Delights! Enjoy This Custom Free 7-Piece Gift with any $100 Order! Value up to $146! Coach: The Thanksgiving Event: 30% Off With Use Code: Thanks17. Cole Haan: Black Friday Sale 50% Off 500+ Boots, Grand Styles, Bags & Outerwear. Plus 30% Off EVERYTHING ELSE!Fall Savings and new markdowns. Crate & Barrel: Black Friday 15% Off a full price item Use Code: SAVE15. 40% Off of lots of furniture items. $150.00 OFF Select Vitamix Blenders. Derma-E: 40% Off Exclusive Sets Use Code: SKIT40 (Ends 11/22). 25% Off Their Top 5 Best Sellers. Use Code: PREVIEW25. Free Shipping on orders over $25.00. Etsy: Amazing holiday gift ideas. Finish Line: Up to 40% Off Nike & Jordans. FOREO: Save up to 25% off on select items at FOREO.com! Use Code: BFAFF17 to activiate the discount before it goes live on 11.23.17. Offer is valid now through 11.29.17 Offer valid only for US customers. Frye: Up to 50% off sale. Gilt: Extra 40% Off: Black Friday Comes Early. Use Code: X40. H&M: Up to 60% Off clearance. No code necessary. INTERMIX: 48 Hours Only | Flash Sale: 40% Off (Ends 11/22). J.C. Penney: Don't miss out on great Black Friday Deals — apparel, toys, gadgets, jewelry, home items & much more. No Code Needed! (Ends 11/24). Online only: Extra 35% off $100 or more, now through 11/27. The challenge is on! Shop over 100,000 deals in store & online. Code: SHOPNOW8. Valid 11/25-11/27. J. Crew Factory: 50% Off Your Purchase! (Some exclusions apply). Juice Beauty: Exclusive Holiday Sets with serious discounts. Kate Spade: Black Friday Take 30% Off (Exclusions Apply). Use Code: GIVEJOY (Ends 11/26 11:59PM PST). Kate Somerville: Holiday gift sets with deep discounts. Kiehl's: $20.00 off of your purchase of $65.00 or more. Use Code: JINGLE (Ends 11/30). 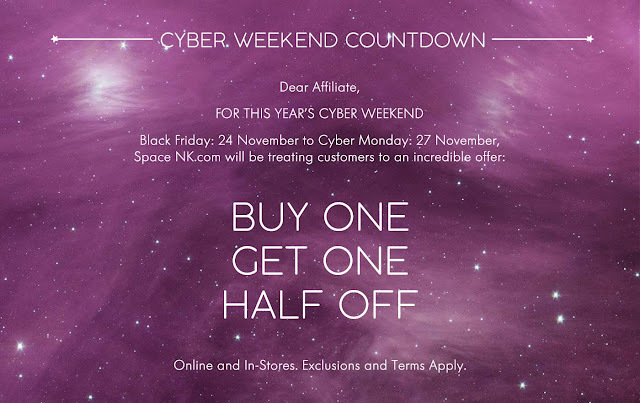 Kneipp: Kneipp’s Black Friday into Cyber Monday beauty sales! Cyber Monday: Starting on 11/27, the entire site will be 40% OFF + FREE Shipping! This is for a limited time only and the sale ends on 11/29. · Free Shipping all weekend long! Lancôme: Receive a 4-piece sample plus Free Shipping on your order of $49.00+ Receive a bonus sample with your order of $75.00+ Use Code: WINTER (Ends 11/30). Lands' End: Receive 40% off your order. Plus, down vests from $25! Use Code: SWEET pin: 1437. L'Occitane: Amazing Holiday Gift Sets at discounted prices. Browse their special offers and exclusive beauty treat discounts. Spend $65.00 and receive a free eight piece Best Sellers Gift. Use Code: GIFT17 (Ends 11/23). Black Friday Doorbuster: 7 Hand Creams for $25.00, or Free with Purchase. Use Code: THANKFUL (Ends 11/26). MacKenzie-Childs: Up to 50% Off Clearance. Rest easy knowing your saucy spoons won’t be sitting on your counter. Instead, keep them propped up in style on a Courtly Check Enamel Spoon Rest. Your gift with purchase of $250+, until November 21, 2017, or while supplies last. Macy's: 20% Off Black Friday Use Code: SCORE. Madewell: The Chillest Black Friday Ever: Enjoy 25% Off Your Purchase. Use Code: DONTSTRESS. In Stores & Online. MICHAEL KORS: Enjoy an Additional 25% Off Already-Reduced Styles. Prices as Marked. NaturaBrasil: Black Friday: 30% off all full-size products + free shipping site wide. Cyber Monday: A free full-size product with $50 purchase + free shipping site wide. Neiman Marcus: Designer Sale up to 40% Off regular prices. NINE WEST: Black Friday Sale – 50% Off Sitewide + Free Shipping! NM Last Call: Black Friday Week. Take an Extra 40-80% Off EVERYTHING. Nordstrom: Black Friday and Cyber Monday Sales are coming. Extra 20% Off Select Sale items. Up to 40% Off Designer Apparel and Accessories. Select your 10x Points Day! : Beauty Sales, Women's Sale, Men's Sale, Trend Sale, Kid's Sale & Home Sale! Nordstrom Rack: HUGE Savings sitewide. Paula's Choice: 20% Off Sitewide + Free Shipping on All Orders+ FREE Anti-Aging Eye Gel Travel Size on $65+ Use Code: GIFT2. Holiday Gift Kits at once-a-season prices. FREE Standard Shipping on All Orders applies to US and Canada only. Free Shipping does not apply to US Territories. Offer expires 11:59 pm PT, December 31st, 2017.3 Free Samples With Purchase. Choose your 3 free sample packettes on orders of $5+ from available options at cart. REVOLVE: Up to 60% Off Sale (No code necessary). Saks Fifth Avenue: Up to 60% Off irresistible shoes. No code necessary. 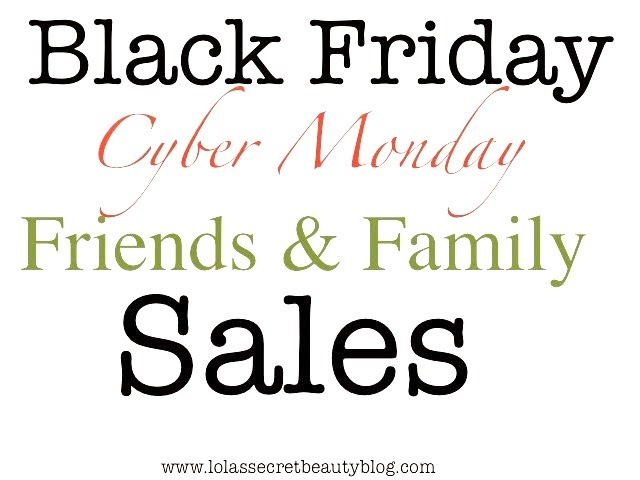 Sephora: Lots of amazing Black Friday and Cyber Monday Specials. There are also lots of incredible Sale Items. Up to 50% Off. Doorbuster Deals: $10.00, $12.00 and $15.00 (11/24 Only). Serena & Lily: Enjoy 20% Off Everything at their Thank You Event. Use Code: CHEERS. Shopbop: Take up to 75% Off Sale Items. Up to 30% Off full-price. Use Code: MORE17. Shu Uemura: 20% off on ANY order over $50.00 and 25% off ANY order over $100.00. Use Code: SHUBF (11/22 -11/25). 5 Free Samples on orders of $50.00+ Use Code: LOLAXSHU (Ends 12/31). Skinstore: 20% off your skin care saviors! Enjoy a free Vichy Mineral 89 Deluxe Sample when you spend $80. Use Code: SEASONAL. Amazing Gifts with Purchase just in time for holiday shopping. Soludos: HUGE Sale on select Styles. Free Shipping on ALL US Orders. Sur La Table: Black Friday Sales Galore! Nespresso Up to 60% Off and so much more! Swell: Black Friday 30% Off Sitewide! Use Code: EARLYACCESS. TATCHA: Black Friday and Cyber Monday deals are forthcoming, and I will publish it as soon as Tatcha allows me to announce it, but I will tell you right now that it is GREAT. Holiday Gift Sets for every price range now available. The Body Shop: Holiday Gift Sets galore. Lots of amazing deals coming! The Container Store: Buy 4 Stocking Stuffers and Get the 5th Free. Up to 50% Off sale items. Free shipping when you spend $75.00 or more. Ulta: Lots of AMAZING Black Friday and Cyber Monday Deals are coming! Sales, Specials and Coupons. Urban Outfitters: 20% Off your ENTIRE PURCHASE. No code necessary. Williams Sonoma: HUGE Selection of Black Friday and Cyber Monday Deals!. Helen, this is the most comprehensive list! Thank you for taking the time to put it all together! Thanks, Allison! You are very welcome! I know just what you mean, Tiki! What are you planning on getting? I am prepping my own list, so many temptations! I can't wait to see your list! So many temptations, indeed! Everyone wants my money and I'm so weak!! I have filled online carts everywhere and need to forget about them. LOL. Thanks for all the suggestions. They want mine as well! I currently have empty carts, but I went crazy at Sephora and Beautyhabit, so I will have to behave myself! This is such a great list. I particularly want to go splurge on B-Glowing, but I'm actually on a no-buy after a mad advent calendar binge, which is just as well LOL! Thanks, Renu! Yes, but you have definitely gotten some amazing Advent Calendars lately. The one from Harrods was absolutely breathtaking!